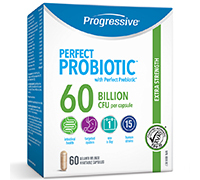 Perfect Probiotic™ 60 Billion is an extra strength probiotic for daily protection and for mild-to-moderate digestive challenges, including gas, bloating and low immunity. It features 15 human strains and the Perfect Prebiotic™ blend to feed and support your entire digestive tract — in a delayed release vegetable capsule. Plus, it’s part of the world’s first TRU-ID® Certified probiotic family; guaranteed to include every strain on the label. A third-party test and guarantee so you can trust the label. Probiotics were once sold exclusively on potency -- from 100 million to 100 billion -- it was all about the number of active cells per dose. But now we know that species matter, too. From Lactobacillus acidophilus to Bifidobacterium breve (and everything in between), they all live in different places in the intestinal tract and offer different benefits in the body. Think of your daily multi: you want to know that every vitamin, mineral and herbal ingredient on the label is really in the bottle. Why? Because you know that each one matters. And it’s no different when it comes to probiotics. But how can you be sure that you’re getting all the species on the label if no one is testing for them? What if your product has the right potency, but the wrong species? Now, with Progressive Perfect Probiotics, the world’s first TRU-ID® certified probiotic family, you can know for certain that every species on the label is indeed in each capsule. TRU-ID® is a breakthrough, independent DNA certification program founded on research and development from the University of Guelph. In a similar way that DNA is used to understand the origins and unique traits of humans, the DNA in our probiotics undergoes rigorous analysis to verify the identity of the species listed on the label. So you can be sure you’re getting what you paid for. Once every probiotic species is identified and verified as correct, and that no other unlabeled strains are detected, our probiotics qualify to proudly display a Certified Authentic TRU-ID® logo. TRU-ID®’s mission is to protect customers from mislabeled or contaminated ingredients, and to promote honesty in consumer product labeling. That’s why we at Progressive couldn’t be more proud to add this extra level of trust and transparency to Perfect Probiotic™ as the world’s very first TRU-ID® certified probiotic family.